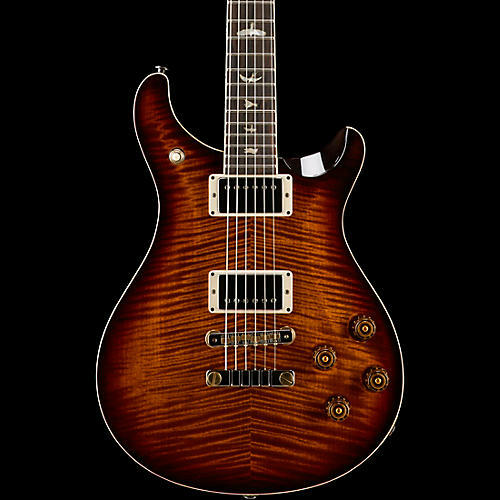 The PRS Wood Library MC594 is a custom combination of features coming together to make a unique instrument. The guitar boosts a selection of tonewoods pulled from the PRS wood library that includes a 10 top of figured maple. The pattern vintage neck is made of artist grade maple with a Brazilian rosewood fingerboard. Smoked black hardware and 58/15 low-turn pickups complete this special guitar, which comes with a hardshell case. The Wood Library program is similar to the PRS Private Stock program in that it is an elaborate menu-based program for the PRS Core line of guitars designed to give dealers the opportunity to build special runs. The wood library is graded on the same scale in which PRS grade their other woods: Core, 10-top, Artist Package, Private Stock. 2 year warranty on parts, hardware, cases, and electronics. Limited lifetime warranty on all other products.